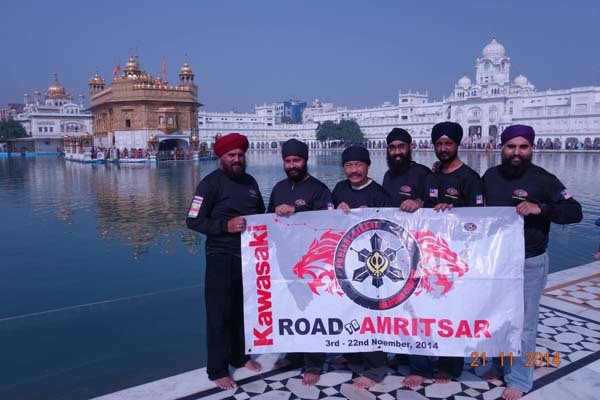 Six riders on an epic ride from Petaling Jaya to Amritsar. Nov 20, 2014. The date will ring in our minds like a birthday to a child, one we will never forget. As we rode closer to the Sri Harmandir Sahib, we were numbed. Not quite sure if this was really happening. In 20 minutes we will be there, in 10 minutes we will be there, in 5 minutes we will be there, then suddenly… we were. We were at the Chowk Ghanta Ghar entrance when we suddenly caught a glimpse of the gold walls of the Sri Harmandir Sahib through the tunnel corridor of the entrance. We didn’t quite react at that moment until we turned the bikes around and alighted. Suddenly we found ourselves fighting back tears. We realised, we are there, WE are finally there. 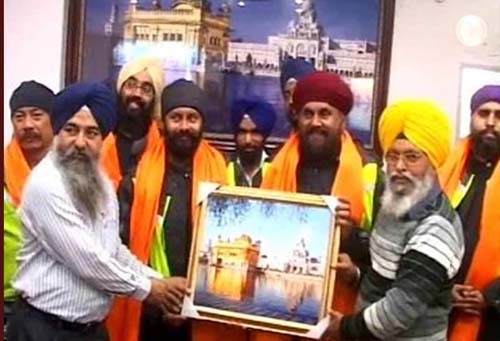 Gurwinder was visibly moved by this achievement. It took a few moments for all of us to digest what we had just done, these moments were later followed by constant un-erasable smiles. We were greeted by the Gurdwara Committee at the Information Counter Room, gifted with books about the Gurdwara and adorned the saffron ‘siropa’ each. Ahoi quickly realised that he may be one of very few non-Sikhs to ever be granted such an honour. After around half an hour, it was time for Ardass. We were led into the temple just around the ‘sarovar’ (lake surrounding the Golden Temple). After Ardas we walked around the ‘sarovar’ and were led into the darbar (main hall) to mathatekh (pay respects). Eventually we were led out and were back on our motorcycles to ride to our hotel, which was barely a minute away. When we checked in, we were a little lost. At least I was. The programme for the last 17 days was always the same. Reach hotel, remove and wash jacket lining, pants lining, T-shirt, underwear, balaclava, socks, hang clothes, charge GoPro camera batteries, make sure GoPro remote is charged, charge power bank, update Facebook, grab quick dinner, get to bed early and prepare for tomorrow. But today was different. Today all I thought was “What do I do now?” Do I still wash everything? Do I charge batteries? Or do I just relax? Anyone who knows me well would know my choice. We went to dinner somewhere close. It was cold, but we were too happy to notice. We talked about what we were going to do the next day. Suddenly all feelings of tiredness, fear, worry, anxiety and disagreements faded away the minute we were standing before the Sri Harmandir Sahib. We were all happy. The next day (Nov 21) we proceeded with ease. We went to the Gurdwara, and later even made our way to the Wagah Border to watch the daily ceremonial retreat. Everyone will prepare you, either correctly or otherwise, for this kind of a journey. Everyone will give you their two cents worth of knowledge for such an endeavour. They will tell you what you need to carry, what you will need in case of any foreseeable or unforeseeable event. They will warn you what will happen between friends when fatigue and stress pierces your will. They will tell you everything. But I don’t know why people never tell you about the last day. The day when it is all over. I felt this deep pain and sadness when Ahoi and I were at our bikes at around midnight, packing the luggage boxes with our jackets and helmets and first aid kits to be shipped back to Malaysia with our motorcycles. I felt this sense of longing when we were discussing the final accounts and handing over our Carnet De Passage to our agent to process our motorcycles when we are on our way home. It was all over. Tomorrow, us brothers, will go back to our jobs, our lives, our families. The epic ride would be over. We would talk about it simply because we will always miss being on the journey. So here is my advise to anyone who will endeavour this or any other long ride in the future. Don’t only prepare for the ride. Always remember that this ride will test your every feature: attitude, physical strength, immune system and ability to handle stress. However it won’t stop there. The guys you ride with will always share a bond with you in the future. Cherish it, because the day the ride is over, you will miss it, you will wish the journey was longer, you will find it difficult to be patient while awaiting the next one. I did not follow my brothers back to Malaysia. Guwi (Gurwinder), Reshu (Resham), Juji (jiju/Jujhar) and Ahoi (Chua Chern Kwang) flew back to Malaysia on Nov 22. I went off to Bombay to meet an old college buddy while Papaji (Gurdial) stayed in Amritsar to join his family for a visit of Punjab.